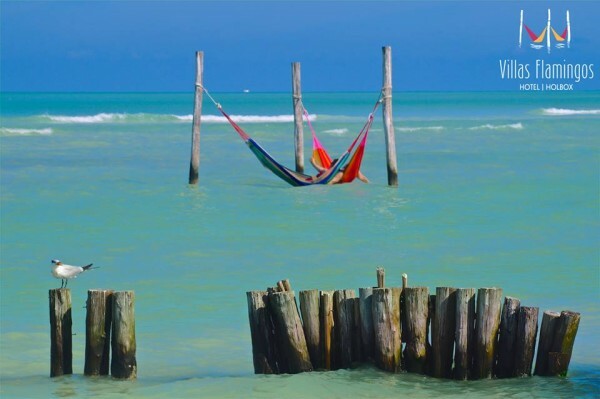 Holbox is famous for its breathtaking sunsets. We bet you will not want to miss one during your stay. 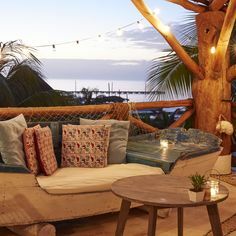 This is a list of our five favorite places to watch the legendary Holbox sunsets while sipping your favorite cocktail or a cold beer. If Holbox is paradise, the Hotel Arena Lounge is the 7th heaven. Tallest building on the island, its terrace offers a 360 degree view and breathtaking sunsets. For the occasion, many cocktails are offered at 2 for the price of 1. You have to try the Coco, my favorite one. The evening continues in a cozy atmosphere to the sound of lounge and house music. Arrive early, bring your swimsuit and a towel, a Jacuzzi waits for you until 7pm. Bar from Hotel Villas Flamingos, maybe their beach is not the biggest but its terrace and pool amply compensates. Great location, you can enjoy one of the many cocktails at the bar Los Pedales. 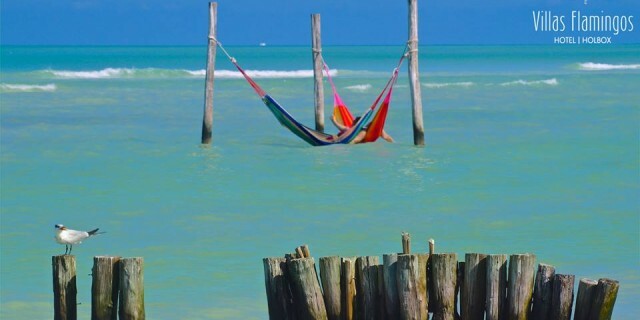 Known for its hammocks placed directly into the sea, they “invite you to let go, relax and enjoy the moment”. Next to last hotel of the hotel zone, this is the perfect place to refresh yourself after a long walk on the sandbanks before returning to the village. Where? On the beach direction to Punta Mosquito. 20 to 30 minutes walking distance from town. Located on the 2nd floor of the Mandarina restaurant in the hotel Casa Las Tortugas, the place reflected the hotel and its clientele. Thoughtful service and attention to detail, you can enjoy a refined and relaxed atmosphere. Be ready to try the Aguachiles, a variety of ceviche but more spicy, and a large selection of excellent sushi. Enjoy its happy hour with a 2 for 1 on wide selection of cocktails. Mandarina Roof Top also propose the largest selection of Mezcal on the island with more than twenty different varieties. Ask to Moises, he will be happy to help you discover the characteristics and complexity of the various kind of mezcal. When? 5pm to 7 pm and later… Closed on Monday. One of the first beach bar on the island, Raices Beach Club & Marina was a small hut where fishermen came together to prepare their catch of the day after a well-deserved day of work. From a simple hut on the beach, Raices is now recognized for its ceviches and on the grill fresh fish. Eat, drint and enjoy the view and its calm waters. The tradition continues in a pure Caribbean atmosphere. Where? On the beach, within 5 minute on foot after the exit of the village towards the hotel zone. 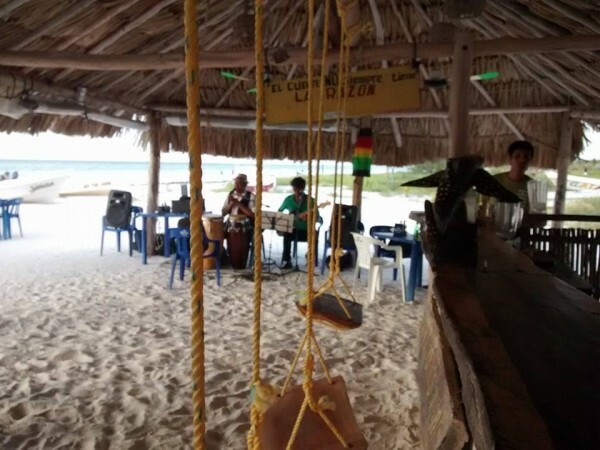 Located on the west side of the Hotel Zone, the Zomay Beach Bar location is appreciated by all sunset lovers. This is the perfect place to take pictures of your sunset to remember. Sometimes a little bit too crowded, but you cannot blame anyone to want to immortalize his stay with the best Holbox sunset. No special prices on cocktails, but all are made from fresh fruit (mango, pineapple, papaya, mint, cucumber). We like the authenticity of its clientele and its cocktails. 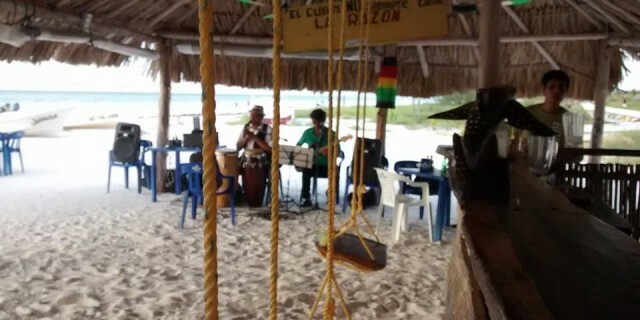 A real beach bar. When? 5pm to 8 pm.